Every once in a while, the world as it is represented to us by capitalist realism unfurls, revealing the realities behind the curtain. Pepsi's universally derided Kendall Jenner advert was such a moment, Jamie Ranger writes. The satisfying click of a soda can. The sprawling urban metropolis at dusk. The lone violinist serenades the city from a skyscraper rooftop. The jet-black fringe of a smouldering craftsman-musician drips crystal sweat, which spits to the touch of the white-hot sparks of his musical metallurgy; the artist as artisan. A young Muslim woman pores over her photography of marching protestors, nostalgic for an alternative present. A celebrity model holds a pose of stony-faced resilience in a hotel doorframe, symbolically linked to the pictures of protest: both are public spectacles reduced to revered images. Frustrated by their lot, multicultural twentysomethings hang out of balconies, slinking out of implausibly spacious apartments into the orgiastic fervour of the streets. We are witnessing an uprising in a ‘eutopia’, very much an ‘other place’ as Thomas More originally intended for the term. Dancers gyrate; musicians pull out their instruments and begin to play; never mind the cacophonous sensory overload of nonsensical noise and movement that this would create; because we have the rallying cry of modern reggae, thundering over the scenes of ecstatic play. Our celebrity, entranced by the commotion, abandons her corporate commitments, eschewing her photoshoot – I won’t be part of your system! – and reappears moments later, her blonde highlights replaced by her, presumably natural, brown hair; her luxury dress replaced with…um…luxury denim, and immediately heading to the front of the march, exuding the charisma of a leader, and welcomed by her generational peers. We’ve all seen that Pepsi advert by now. The one in which intersectional, intergenerational antagonisms between power structures and the oppressed are reducible to our shared yearning for the cool, refreshing taste of carbonated sugar water. The demands of the young are inexplicable to an economic narrative that posits consumerist individualism as emancipatory freedom. The complexity of social experience, deracinated by the ideological sausage-machine, appears to us as an urban spectacle pitting a multicultural millennial generation angry at ‘the Man’ against handsome, ‘love-to-hate-to-love’ police officers, WHO ARE JUST DOING THEIR JOB™; a job that apparently doesn’t require the military-grade hardware they usually wear with resplendent self-assurance. Protestors march with a euphoria usually reserved for Coachella, lofting placards with triumphalist slogans such as ‘Peace’, ‘Voice’ and ‘Join The Conversation’, an ephemeral populism that exists solely in the ketamine-dreamscape of a DNC press officer, the ludicrous tin-ear for social movements that only corporate advertisers could truly conjure-up (the sort of commercial ‘imagineer’ who thinks the phrase ‘stay woke’ belongs in Starbucks literature). But who to represent the downtrodden masses, the lost generation, the children of the internet age? Who else but Kendall Jenner, a woman who grew up under the spotlight of the entertainment-surveillance complex, famous because her sister was made famous because her mother insisted that they flog their privacy to become famous. Kendall Jenner represents millennial culture for late capitalism because she is a social media entrepreneur, which is presumably the height of all aspirations for ‘digital natives’. Thrust into the spotlight through no fault of her own, she is then criticised and castigated for being famous for fame’s own sake, and therefore has become the poster-girl of the millennial stereotype: a narcissistic opportunist obsessed with self-promotion, because aren’t all young people simultaneously overcome with awe and jealousy at her views, ‘likes’ and followers? Aren’t we all just YouTubers with boxes of self-printed t-shirts and hoodies, desperately hawking exaggerated versions of ourselves to one another? Don’t we love chatting away on BookFace and Read-It, talking to our favourite friends and corps? With the right dank meme, we can change the world. Like, comment, subscribe! Every once in a while, the world as it is represented to us by capitalist realism unfurls, a gentle updraft under the viridian curtain that incidentally exposes the wizard. The wallpaper of the haunted house peels back and snaps like pork crackling on a roast hog, and oozing from behind the waxy surface emerges a jowly grotesque, the squealing contorted face of a beast in repose: the monstrous death-throes of a global economic order. Before eventually pulling the ad under the weight of universal incredulity and outrage, PepsiCo were initially quick to defend it: it represents diverse people uniting in a ‘spirit of harmony’, it claimed. But the symbolic violence has already been perpetrated: the police are extra-judicially murdering your community on racial grounds? Tear-gassing students marching to protest the wage conditions of college cleaners? The state allowing the police to pass on people arrested for minor offences onto immigration officials at the latter’s discretion? Look past these wrinkles in the social fabric, and the triviality of your experience, to the truth that will unite us all: we’re all consumers! Don’t worry, millennials! If your product is good enough, the cops will buy it! That must be what we’re angry about, right? No-one is downloading your app? All political grievances are thematically reduced to a versimilitudinous naïve wail for peace, collectively asserted in an idealistic, globalised public sphere in which the world seems to be fine as it is. Political protest is represented as an ahistorical carnival without content, the irrational impertinence of youth in revolt, demanding of the system what is already produces, and for whom it already caters. Finally, our photographer has found an image worthy of her time! 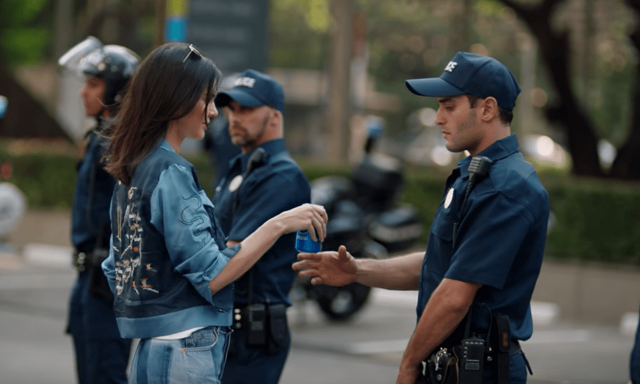 Kendall Jenner offers a cop a refreshing can of teeth-numbing bubble syrup, straight from the metaphorical fridge, and he obliges, an intentional cultural reproduction of ‘the flower in the gun’, the spirit of the 60s, the baby-boomers remembering their own churlishness in the face of the American empire. The assembled erupt in a jubilant roar of victory as the police officer sips on his sugared water, and turns to his fellow law enforcer with a look that says, ‘when consumer products are this delicious, maybe we should all just get along?’ Aww, doesn’t the police officer look so sympathetic and reasonable? It’s almost as if the capital they protect has provided the symbolic content to frame them in a positive light! The beauty of the ideological inversion is borderline poetic: it’s the state and its institutions that do not appreciate the majesty of capitalism: the youth understand consumerism better than the old- move out of the way, granddad, I’ve got chains to run into! As I write, my country is suturing itself from its European allies, like a samurai from his innards, in an act of economic self-flagellation, and indeed may tear itself into its component parts. Our unelected Prime Minister has just been to Saudi Arabia, where she refused to denounce the bombing of Yemen and, instead, was busy furthering arms sales to the despotic kingdom. Meanwhile, our trade minister cosies up to Rodrigo Duterte, president of the Philippines, a man who has openly encouraged his citizens to murder drug addicts, and all but admitted to having murdered ‘criminals’ himself. As fascism under the guise of ‘nationalist populism’ festers across rural Europe like mad cow disease, the liberal democratic order puts its fingers in its ears, and sells the electorate bland, millionaire ex-bankers as ‘enigmatic centrists’. Across the Atlantic, an orange gibbon in a hairpiece spouts conspiratorial drivel whilst threatening nuclear aggression, and the only consolation available comes in the form of erudite think-pieces. I’m going to need something stronger than a Pepsi. The revolution will be self-parody. « Previous: Special Report | What was Theresa May actually doing in Saudi Arabia? And who was she doing it for?